People ask me all the time, how’d I lose weight? 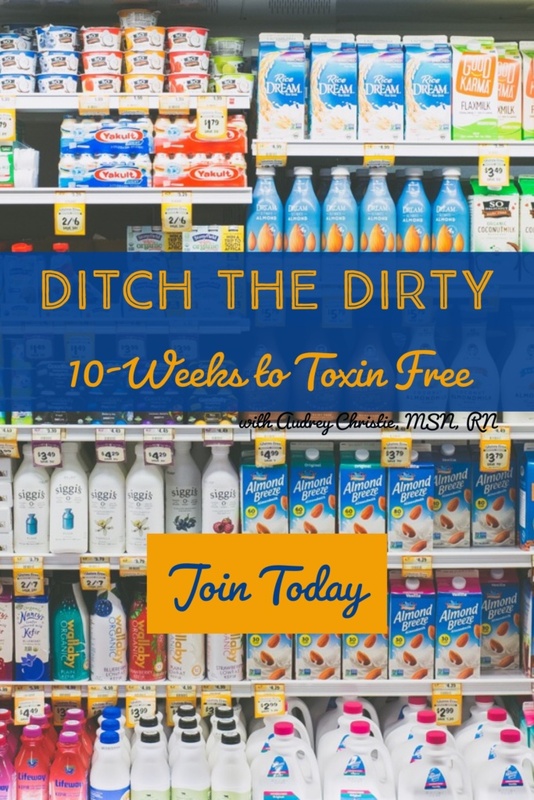 And then when they see me out to dinner, they often wonder if I am backsliding when I eat some cheese fries or assume I am starving myself if I order just a tea or water. NOPE! 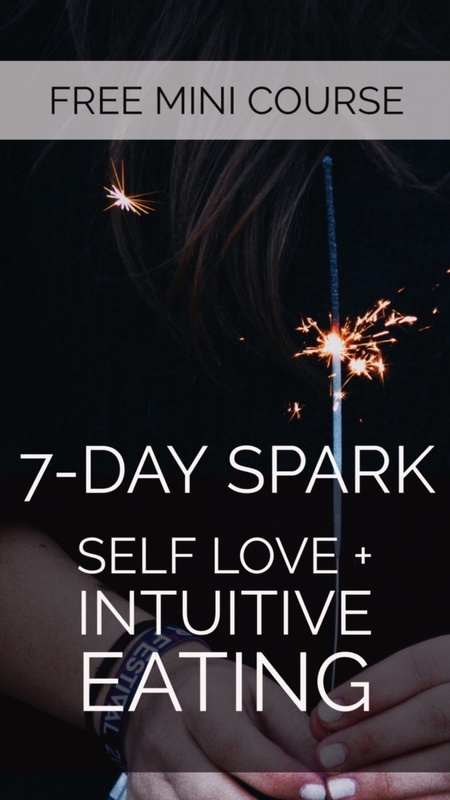 I don’t use a lot of hacks to lose weight, I have 8 simple principles and frankly I still love to eat amazing food! (and sometimes cheese fries too!). My hubs on the other hand likes to eat keto style. (Which although I don’t believe is sustainable long term, is helpful for him now). And because of that I came across some recipes on various fitness and keto diet sites for this cloud bread stuff. These recipes had some horrifying stuff in them, like Sweet n’ Low. YES ARTIFICIAL SWEETENER! People were putting it in their food ON PURPOSE! WHAT!?!? Some had greek yogurt in it, which was fine but for keto peeps as few carbs as possible is really important. 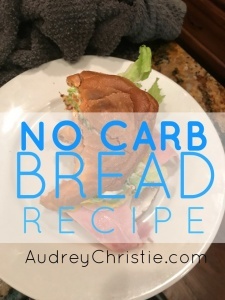 So with some trial and error, I came up with this Clean Cloud Bread Recipe, that fits into my clean eating style and meets his keto needs. And its pretty damn good. It also makes a lot, so its good for a prep recipe that you use all week. Line 2 cookie sheets covered with silicon baking mats. Place wire racks for cooling on the counter. 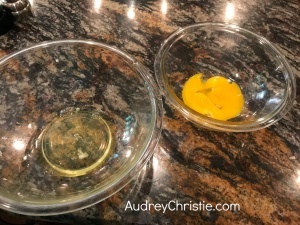 In two bowls, separate the egg whites in one and the egg yolks in the other. Add you cream of tartar to your egg whites and beat until stiff peaks form (about 4 minutes). Add your salt and sour cream to the bowl of yolks, whip until well mixed. Gently fold the yolk mixture into the egg white peaks, careful no to over mix and break the whites. 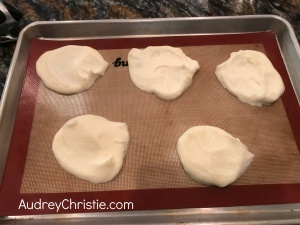 Spoon and smooth the mixture into 6 round “bun sized” places on your cookie sheet. Place in the over for 30 minutes until golden brown. Remove from pan to the wire racks to let complete cool. Voila! Enjoy! Store in the fridge. It tastes remarkably bread like. We like to make BLT’s with our Cloud Bread.